The Vietnam National Administration of Tourism (VNAT) and the Ministry of Culture, Sports, and Tourism have repeatedly called on the government to enact measures to ‘save’ the tourist industry, which has reported declining tourist arrival numbers for 12 months in a row, since May 2014. Prime Minister Nguyen Tan Dung approved many propositions of the two agencies during a government meeting late last month, bringing about hopes that Vietnam would soon be able to lure back international visitors. The Ministry of Culture, Sports, and Tourism has proposed scrapping visas for countries that are Vietnam’s key tourism markets, or those it has strategic or comprehensive partnerships with, which has secured in-principle approval from the premier. The countries that are likely to enjoy free-visa rules from Vietnam are the UK, France, Germany and Spain, which have strategic partnerships with Vietnam; and Australia, New Zealand and Canada, the Southeast Asian country’s comprehensive partners, according to newswire Van Hoa (Culture) Online. “Tourists from these countries will be given a 15-day stay for each entry over five years,” Van Hoa Online quoted VNAT chief Nguyen Anh Tuan as saying. The visa waivers for the first group of countries are expected to take effect on July 1 this year, and the second group, July 1 next year, according to the VNAT director. Vietnam currently applies one-sided free-visa rules for seven countries, including Japan, the Republic of Korea, Norway, Finland, Denmark, Sweden, and Russia, and scraps visas for nine Southeast Asian countries including Brunei, Myanmar, Cambodia, Indonesia, Laos, Malaysia, Thailand, Singapore, and the Philippines. Starting next month, Vietnam will also waive visas for tourists from Belarus, according to a resolution the government released earlier this month. The waiver will be applied within five years, from July 1, 2015 to June 30, 2020, with an allowed stay of 15 days for each entry. Tourists from the Asia-Pacific region accounted for 72% of international arrivals to Vietnam, followed by Europe (14%) and North America, according to a VNAT survey. The government approval of the visa waiver proposal is seen by industry insiders as “an invitation to international tourists who love to explore Vietnam,” and a boost to the country’s tourism. The visa waivers granted to Russia, Japan, and the Republic of Korea have indeed paid off, as vacationers from these countries collectively made up 23.6% of Vietnam’s tourist arrival numbers in 2014, according to the same VNAT data. Vietnam scrapped visas for Japan and the Republic of Korea in 2004, and the number of holidaymakers from these countries has since increased 2.4 times and 3.6 times, respectively. 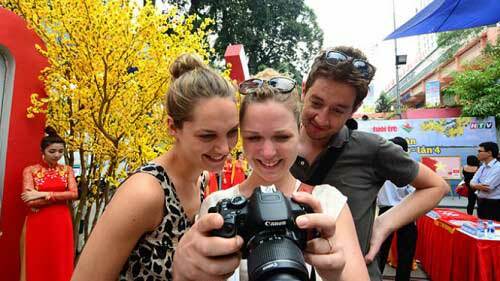 The number of Russian tourists visiting Vietnam in 2014 was 7.45 times higher than in 2009, when they began enjoying visa waivers from the country. Nguyen Huu Tho, chairman of the Vietnam Travel Association, said waiving visas for more countries is inevitable at a time when Vietnam is struggling to compete with other regional tourism destinations. Hoang Huu Loc, chairman of the board of members of Saigontourist, a leading tour operator in Ho Chi Minh City, said Vietnam should also scrap visas for nations that have non-stop flights to the country. Free-visa rules will encourage international vacationers to come to Vietnam, and having a non-stop service there is a plus, he said.